Children can develop tooth decay at an early age, so it is important to start dental care early. Looking for cavities is only the beginning, and early dental care includes teaching a child proper mouth care, going over your child’s developmental milestones, and discussing the importance of good oral hygiene. A child’s first adult molars erupt at approx. six years of age. The dentist and hygienist will evaluate these first molars to determine their vulnerability to decay, and may recommend dental sealants. Dental sealants are a plastic material that is applied to teeth to form a barrier against bacteria that can form cavities. See the menu item” Sealants” to view more information about this procedure, which can help protect your child’s teeth from dental decay. When should I schedule my child’s first dentist appointment? 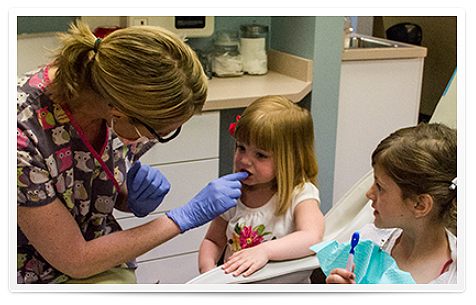 According to the American Academy of Pediatric Dentistry, a child’s first check-up should be scheduled at approx. one year of age. Even if there are only a few baby teeth visible at this age, this is the start of developing healthy habits that will make future visits much more pleasurable. How should I prepare my child for their first visit to the dentist? Your child will pick up on your feelings, so try to be calm and positive about their visit. We spend our first visit simply talking to your and your child, looking at his or her mouth, and getting an initial assessment. It is a good idea to bring a favorite toy or snack. Fill out necessary forms in advance to save time and trouble on the day of the appointment. See our menu for Online Forms. What will happen at my child’s first dentist appointment? First, one of our friendly dental assistants will show you back to a treatment room. Your child can sit in the dental chair, or they are more comfortable, they can sit in your lap on the dental chair. Next the dentist will sit with you and simply talk. He will do a show & tell to let your child see and touch some of the things used in the exam, such as gloves, or the light, or the buttons on the chair. We want your child to feel comfortable and in control. The first visit can be anything from simply “counting your teeth” (actually checking for cavities, but counting is more fun), to a cleaning and simple polish. No matter how much or how little we accomplish in this first visit, our first concern is to make the experience pleasant and even fun for your child to set the stage for future positive visits. What are some other helpful hints for my child’s first dental appointment? If you have a toddler who has never been to the dentist, schedule a “get acquainted” visit to introduce your child to the dentist and visit the office prior to the appointment. Prepare your child for the experience, and explain that the dentist if a friend who will help keep their teeth healthy. Tell them the visit will be fun. Answer all of your child’s questions positively, and avoid using scary words. Check-ups and 90% of first visits have nothing to do with “shots,” “hurt,” or “needles”, so there is no need to even use these words. Read your child a story about a character who had a good dental visit. “Show Me Your Smile” from the Dora the Explorer series, and Dr. DeSoto by William Steig are great, positive, introductory books. Make a list of questions in advance, including any questions about home care, injury prevention, fluoride and tooth development. If the child has an older sibling that behaves well, bring them in to the sibling’s appointment so they can watch and model their sibling’s good behavior and positive experience.